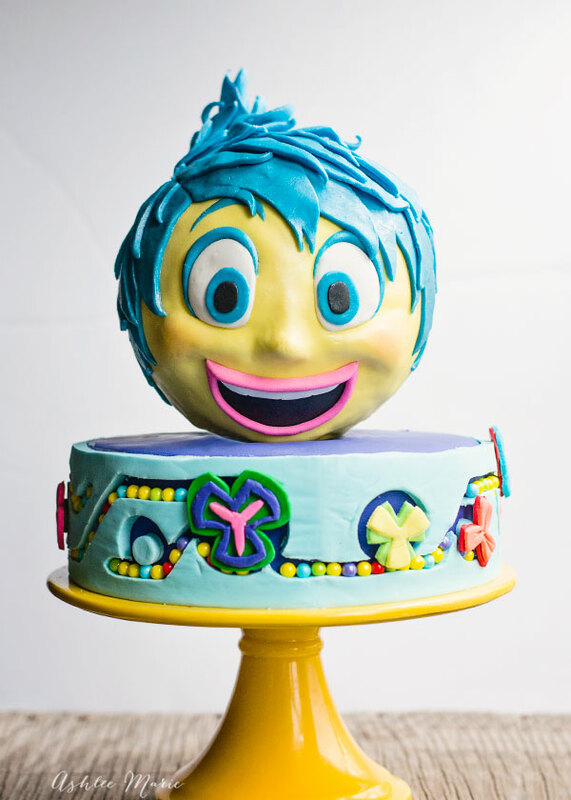 And the centerpiece of the Inside Out Party… This Joy cake! Joy on top, with details of headquarters on the bottom tier. 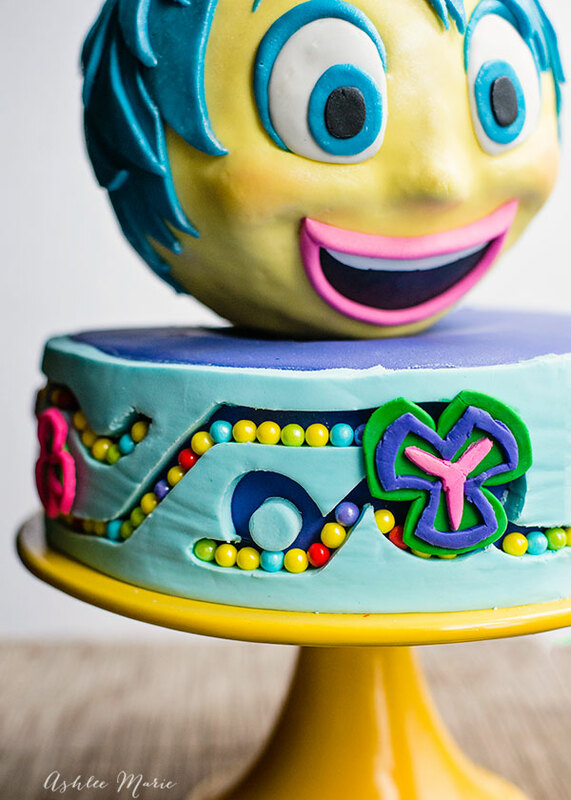 I was actually inspired by the Disneyland Inside out float for the bottom tier. 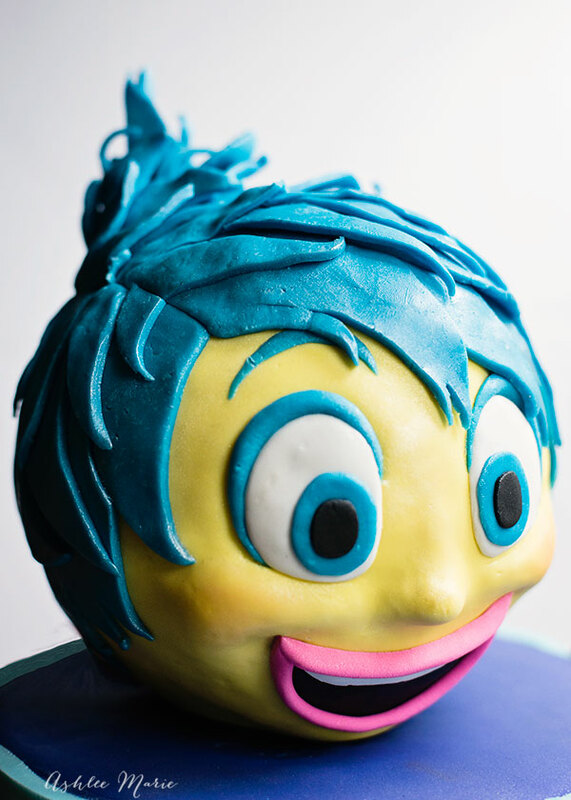 I was actually thinking about just doing Joy from the eyeballs up, half a circle, cause I thought half a head would look less weird coming out of a cake than a head on it’s own, but then she just kind of worked out. So I tried something new for this cake! I made modeling chocolate for her hair! It’s more flexible than fondant, but also strong. I knew with it her hair would hold up better, but it’s not good for everything cause it never fully hardens, like it wouldn’t work at all for the gears. It’s my first time trying it, but I definitely can see the possibilities and will be trying it again… PLUS it tastes like CHOCOLATE candy vs nasty fondant. I’ll try it on a full cake next time. I used it for the eyes, eyebrows and “mascara” as well. Since they are all the same color and color matching fondant would be too hard. Since it’s so flexible you CAN see every fingerprint. AND even after a day it’s still soft enough you can squish and ruin, so be careful. BUT it’s also easy to soften edges by rubbing it, AND if something gets messed up a day later you can usually still repair it, so molded chocolate has it’s strengths and weaknesses just like fondant or gumpaste. So what other movie characters do you want to see as a cake? Any DVD’s or Theater movies your looking forward to turning into a party? It’s funny but at this point when I watch a new movie it’s all about how I would turn it into a party, food and a cake! Good thing I have a lot of kids to throw parties for, huh? This cake is crazy ridiculous AMAZING! You really outdid yourself on this one. . . . all I have to say is WOW! Awww thank you so much! I’m super happy with how she turned out!